I have been blessed to have been working with crystals for the past seven years. I have photographed and documented the features of hundreds of crystals. In 2014, we received more shipments of recordkeeper crystals than I had ever seen. I heard other crystal dealers sharing this same observation. These ‘rare’ types of crystal formations were beginning to appear in greater and greater quantities. I have always loved working with recordkeepers, so it has been a dream come true for me. The wisdom and insight into my life and my entire perception of time and space have been shifted as a result of my work over the past year with these crystals. I believe that Mother Earth is helping us to prepare for our ascension into the New Earth by releasing wisdom from the past that we are now ready to embody to create our future. Crystals are medicine and they are food for our minds, bodies and spirits. As we work together to integrate the use of crystals into our everyday lives, we can begin to shift our vibration collectively with greater ease, less dis-comfort and higher levels of health. What is a RecordKeeper Crystal? A recordkeeper crystal is one that has been programmed energetically with divine knowledge from the past. Recordkeepers all have a sacred symbol, most often a triangle engraved on the face of the crystal. These triangles can be difficult to see and may appear and disappear. You have to look for them carefully by examining the faces. The wisdom comes through differently from each type of recordkeeping formation. The triangle is the first symbol of the holy trinity. It represents the perfect balance achieved when the physical, mental and emotional aspects of our being are aligned with a point of spiritual light at the top. The recordkeeping triangles serve as the eye of the crystal and as a doorway into powerful wisdom. This symbol on the recordkeeper crystal indicates vast resources beneath its surface that are capable of being psychically retrieved. Recordkeepers were both programmed by the root races of the Atlantians and Lemurians and naturally formed by emanations of wisdom that were practiced over time in certain places, like India, and shaped the formation of the crystalline earth. The majority of all recordkeeper crystals that I came across are Tibetan Quartz. It was actually rare for me to receive a piece of Tibetan Quartz over this past year that was not a recordkeeper, and I saw hundreds of Tibetan Quartz Crystals. Most recordkeepers are found within quartz crystals. Recordkeepers are generally found in a triangle shape. These shapes can either be raised from the surface or sunken in. The raised form provides access to universal information. Crystals # 2 and 4 are raised recordkeepers. Sunken recordkeepers may connect more with personal information and spiritual history or prophecy. Crystals #1 and #3 are sunken recordkeepers. I have come across crystals with a sunken formation in the shape of a crystal; a triangle at the top and rectangular bottom (Crystal #3). I worked with them in the same way I worked with the recordkeepers and found their insights and wisdom to be parallel. Most recently, I have found plate like formation on the top of the crystal faces (Crystal #4). Often when recordkeeper formations are found, they are in clusters, with many recordkeeper formations together on one face of the crystal. The plates I found were in a triangle shape but with a rounded top and bottom. Once again, I dove in and worked with them like I would the other recordkeepers, and I found the energy form these rounded recordkeepers to be much more feminine in the energy of the wisdom that came through. Overall, I feel that Mother Earth and ancient civilizations together have left key from the past within each crystal. If we only look to discover what others have discovered, we lose the magic of developing close intimate relationships with these magical gems from the center of Mother Earth. When we just open to the record that are held within each crystal, I believe we will begin to expand our awareness of the true record keeping potential of each crystal on earth. Recordkeepers connect with the wisdom and esoteric knowledge of the universe and of higher consciousness. The records held within recordkeepers feel like deep peace and divine understanding once you access them. You may see or sense another time or space reality when working with a record keeper, and you will always find deep peace connected to your past when you work with them with an open heart and mind in a meditative space over time. There are libraries of wisdom contained within each recordkeeper formation. With an open mind and a pure heart and with time and attention, you will unlock this wisdom. You can not force a recordkeeping formation to release it’s wisdom. It is like digging up a big plant with roots that seem to grow endlessly into the earth. Regular attention every day, patience and determination are your greatest assets for working with recordkeepers. For me the experience happened much like a flood, all of a sudden all of this wisdom and insight entered my mind after months and months of working with these crystals. When it was happening I wasn’t even sure the wisdom was coming from the crystals, it just seemed to fill my mind. It was only over time as I returned to my meditation practice with recordkeepers that I grew to understand the way the recordkeepers communicate. It is an intuitive connection, words, images and sense of knowing enter you, almost like magic, this is the medicine of the recordkeeper. There are many meditative paths to take to communicate with a recordkeeper. Begin by creating a clear and quiet space to meditate in. Add candles, fresh flowers, a bowl of water, and any sacred items that you desire. This will be a space to develop a sacred relationship with the crystal in. As you enter your meditation time, you can ask for clarity about anything in your life that is not clear or is causing you conflict. 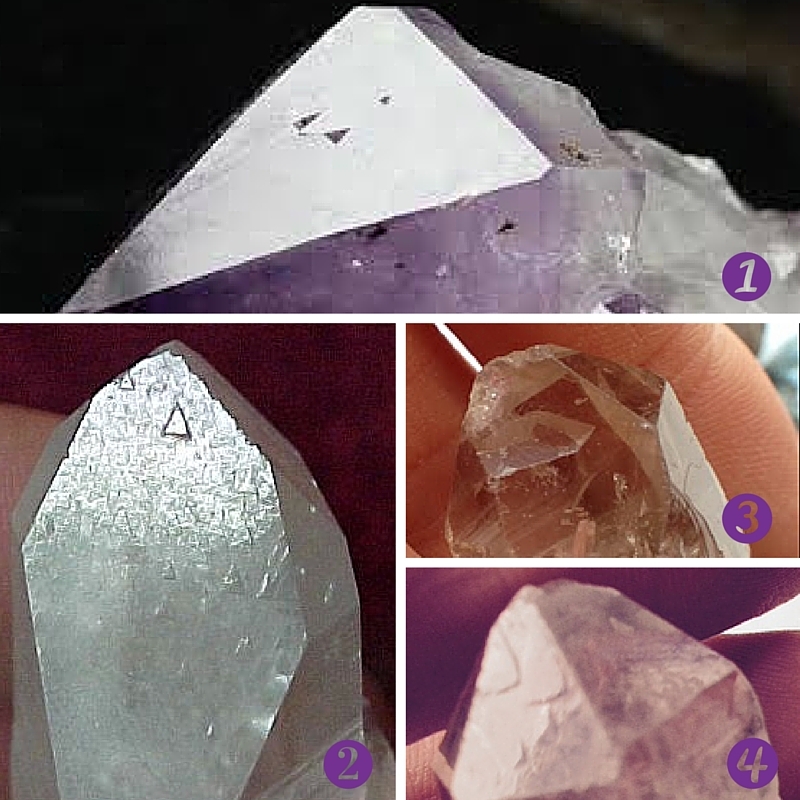 One traditional method of connection is to hold the crystal in your hand in a meditative space while rubbing the triangle. Another method is to hold the crystal with the recordkeeping formation on the third eye chakra area. Try both practices. Keep your mind open and say a prayer to align with the crystal. Give yourself 15-20 minutes within each of these practices and repeat them as often as you would like over time. The more time you spend in meditation with these crystals, the easier and easier it will be to open to their wisdom. If you are needing confidence or if you find yourself doubting or lacking commitment to your crystal healing practice, affirmations are a powerful way to align your mind with the highest vibrations. Crystals communicate at frequencies higher then the frequencies of human communication. As you raise your own vibration through practices like affirmation, prayer, energy healing and healthy eating, it becomes easier and easier to interpret the guidance coming through these portals of light and wisdom within the crystals. Here are a few affirmations to get you started! All wisdom is stored within my consciousness. I listen to the guidance that flows through me. Crystal Enlightenment, Volume I.; Katrina Raphael. The Book of Stones: Who They Are & What They Teach; Robert Simmons, Naisha Ahsian. The Essential Guide to Crystals, Minerals and Stones; Margaret Ann Lembo.